In recent years huge migrations have rebuilt the geography of Europe. Southern youth moving northwards towards more democratic democracies, old northerners moving south seeking warmth and sociality; east to the west, west to the east. Same nations hope to become part of that rusty, young, but already infirm thing that is Europe, others want to escape from it like rats from a sinking boat. A boat of hope. Still? A conjunction of nations kept together by sporadic exchanges of people, more than by enlightened policies. Different stories, destruction of cliches, re-building of walls, homecomings, parents waiting, skies of different colours, fast clouds, or immovable seas. Lives that are peaceful and rewarding even at -10°. The anarchy of the south, Jante Law in the north; Christ(s) crucified on contactless crosses, built upon mountains of HDR screens, and 125 species of fish, including wild salmon and trout in the Thames. And we? Creative youth of this ever-changing greater nation, how are we doing? How is it to live where you live? Have you moved 1000 km from home searching for fortune? Was it worth it? I want to create a meaningful selection of stories expressed with the format of video/short movies. 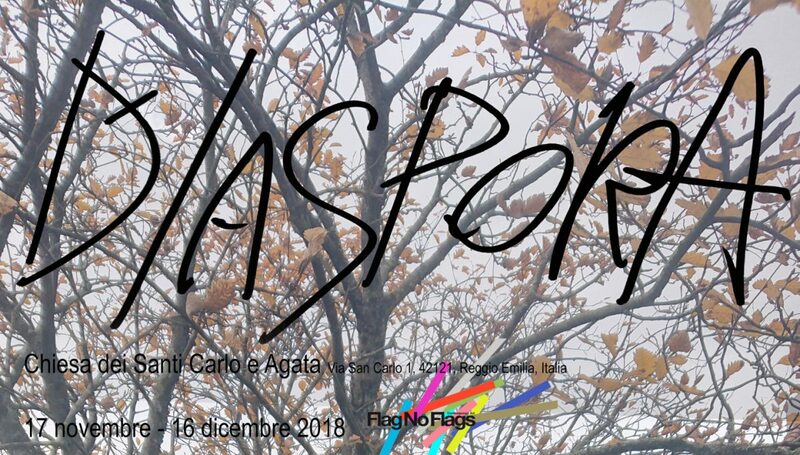 The exhibition will be shown in the Church of S. Charles and Agatha in Reggio Emilia, Italy. The church is venue to the cultural organization Flag no Flags, who, since its inception, is dedicated to the themes of movement of people and thoughts. -Opening 17th of November at 18:00. The exhibition will last a month. -All videos will be subtitled in Italian. Captions must be available in English, they’ll be translated , and you’ll have to apply them to the video. – All artists are invited to participate. The above little concept/sketch is Euro-centric due to my background, but I’d more than happily open it up to even more stories. – Any video that could fit the title is welcome. The theme of Diaspora can be approached in a very abstract way.